Do you ever struggle with keeping up your home? I know that I definitely do! Here are 10 tips that have helped me on my road to attempting to be a better homemaker (and not the kind that burns Rice Krispie Treats three separate times on the same batch). 3. Buy Extras of Pantry Items You Use Often – I make an attempt to always have at least one extra container of things like ketchup, mustard, light Ranch dressing, spaghetti sauce, vinegar, and a number of other items. I keep them all in the same area of the pantry, and try to remember to stock up on some of those things during good sales. 4. Write Up a Cleaning List for Your Home – I have tried to use a lot of downloadable lists from around the Internet to know what to clean around my house. However, I have found that for our cleaning days, it has been the most beneficial to us that I typed up a list of what tasks need to be done and now print it out each time. It helps everyone in the house know what needs to be done, and it’s a time saver for us. 5. Keep Extra Vacuum Bags and Belts in the House – If you vacuum uses these items, it is so handy to have them in the house rather than to be vacuuming right before guests come for Easter dinner and realizing that your bag is too full or that your belt has snapped. 6. Compile a Binder of Your Favorite Recipes – I have a shelf full of cookbooks. Hands down, however, my favorite and most used is a three-inch binder that I have used to put in recipes from magazines, blogs, websites, emails (when I have requested recipes of dishes I have liked that people have made), scanned from my Mom’s own recipe binder, and so on. 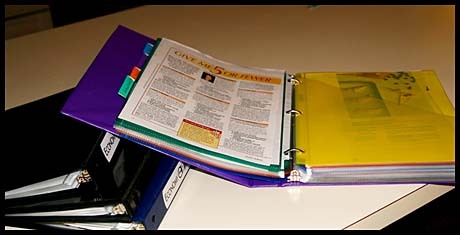 If you tend to keep these kinds of recipes, a recipe binder is a perfect project for you too! 8. Set Up Some Type of Money Management System – Whether you like to use envelopes for your bills, an Excel spreadsheet, a paper ledger, or some online program like Quicken or Pear Budget, it’s beset if you know where your money is going. It’s easy to spend a lot more than you mean to when you don’t have any idea where that money is going. Know why I also like tracking it? Because when I am putting what I paid on all of our bills and notice that I don’t have an amount to put in for the water bill, it probably means that I need to grab a shovel and dig out the pile on our counter. 9. Enlist the Kids to Help – If you have kids, they should be helping at some level with something around the house. Of course, infants are excused. (Go about your business, infants.) Even toddlers can and should help though. At my house, my kids range from six to eleven. I know that I don’t make them help enough, and I certainly didn’t make them help as early as they should have been helping. Know how I know that? It’s because they still get pretty excited about tasks like setting the table and moving laundry from the washer to the dryer. (They do not, however, get excited to help when we do an all family house clean up. They are apparently getting used to that.) If you’re really stumped as to what to have your kids help with, check out some of these age appropriate ideas. 10. Adjust Your Attitude – If you grumble about all of those tasks that you have to do around your house, you might consider adjusting how you think about those tasks. There are way more than 10 things a person can do to be a more efficient homemaker. And, believe me — I need all the help I can get. Please share some of your tips for more efficient homemaking. This post is linked to Top Ten Tuesday and Works for Me Wednesday. I really like the idea of typing up my own, personalized cleaning list. I think that would save me a lot of time and help to avoid those little things that tend to get overlooked. Great tips! I need to make a recipe binder. Right now I have bits of paper scattered all over with recipes I’ve printed off from blogs. Definitely do it! My recipe binder is one of my favorite things in my kitchen. It is such an amazing resource. Great list! Yes, I love #1, 4, 6, and 10, too! I hope to do #9 when my son is old enough. Thanks for these other ideas. I’ll second the idea of keeping spares around, and suggest that it go beyond ketchup and salad dressing. We’ve made it a habit to buy printer ink and science boards and deoderant and toothpaste as soon as we open one, so that we’re ready when they run out. It invariably happens (especially that printer ink) at midnight the night before the school project is due! Right now, I’m in desperate need of going to the grocery store. Not only do I not have go-to meals on hand, it feels like i don’t have any meals on hand.